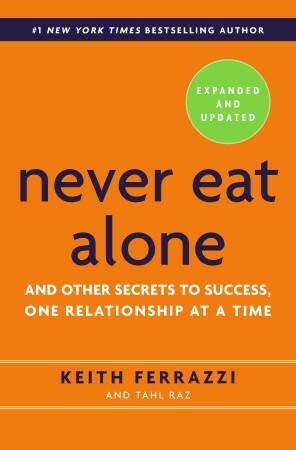 The 2005 version of this bestselling business classic Never Eat Alone, on networking and the power of human relationships, was updated and extended to stay in sync with modern technology and changed circumstances in Keith Ferrazzi‘s own network. The author is a true example of power connector, the one that really understands the impact of weak ties, the art of giving (David Grant’s Give & Take is referred to now), and other practices to build and maintain relationships. From 5,000 contacts on Rolodex, tools like Plaxo (up and coming in 2005), to modern ubiquitous LinkedIN, Twitter and Facebook. Ferrazzi shares his own personal life story. Born as son of a small-town steelworker and a cleaning lady, paved his way to Yale University, and a Harvard MBA by connecting to people. A series of Chief Marketing Officer posts continued the need for pitches, public speaking, and attending conferences, dinners and fundraising events. Ferrazzi’s well known to politicians, C-suite executives, got himself listed in Crain’s 40 Under 40 and was selected as a Global Leader for Tomorrow by the Davos World Economic Forum. He proves every now and then that the 6 degrees of separation are a maximum to reach to anyone. The author shares tips on cold calling, follow-up to conferences, how to network at events, overcome fear of public speaking and categorize and prioritize your contacts. Reaching our and maintaining relationships are key. Being King of Content by sharing, helping and referring. An information hub in a niche with an expertise. Serving others, and understanding interdependence. Others can and will help you with your interests and goals. Next to his own stories several interviews and side stories from Winston Churchill to Bill Clinton, Vernon Jordan to the Dalai Lama are illustrations of the principles. Ferrazzi shows that you don’t have to be rich, famous or wizz kid to become a power connector, providing tools within everyone’s reach. Keith Ferrazzi is founder and CEO of Ferrazzi Greenlight, a marketing and sales consulting company. He is the author of the #1 New York Timesbestseller Who’s Got Your Back and has been a contributor to theWall Street Journal, and Harvard Business Review. Earlier in his career, he was CMO of Deloitte Consulting and at Starwood Hotels & Resorts, and CEO of YaYa Media. He lives in Los Angeles and New York.